Indian cricketer Dinesh Karthik, who is currently in the news for his remarkable performance during the Nidahas Trophy series match against Bangladesh. This journey of Karthik was not easy as he has seen many ups and downs but this match series has brought good changes for his career too. Recently, he has been appointed as a captain of Kolkata Knight Riders in the upcoming IPL 2018 eleventh season. You all have to know the player for his blistering performance that he played for the team India. 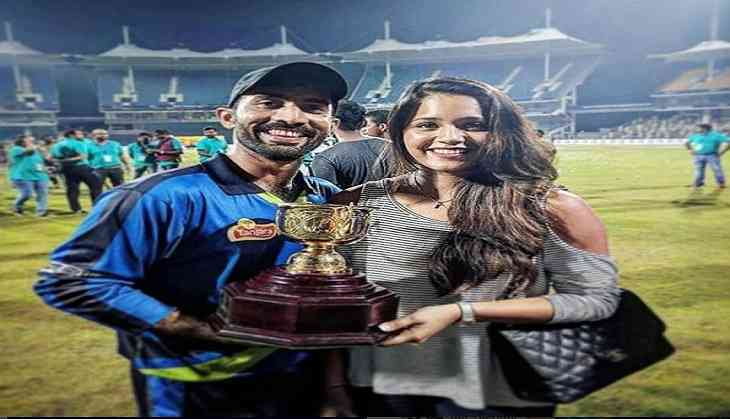 But, do you know about his wife Dipika Pallikal Karthik. However, Dipika is the second wife of Dinesh as he first got married to Nikita. They were separated because Nikita had an affair with Karthik’s colleague Murali Vijay. Dipika is an Indian squash player and she has represented India in various tournaments. Her first international tournament was in London when she was only a sixth class student. She is also a professional model and also awarded the most prestigious award in the field of sports with Arjuna award and Padma Shri by the Indian government. Dipika is also a brand ambassador for a sports brand. The interesting part about her is that she doesn’t like cricketers excluding her husband. Because she feels that the cricketers take all the limelight due to which other sports unable to get the attention that they deserve. For #JFW awards tonight. Wearing : @shriyasom Styled by : @pallavi_85 Make up : @prakatwork Hair : @rachelstylesmith #dreamteam ! Whisked away by the husband to this heavenly place❤ #dpdkadventures #beachsunwinerepeat !